Silikal puncture resistant floors are found wherever tools may be dropped and of course even in nightclubs where high heels easily puncture lesser floors. Puncture resistant flooring is a pure necessity wherever high heels are known to be worn. 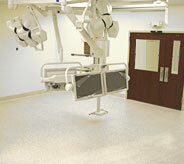 Floors that are puncture resistant may be found in operating rooms where an errant dropped scalpel may puncture the floor. One wonders just who would need puncture resistant floors? Good question, but then consider for example a commercial kitchen. 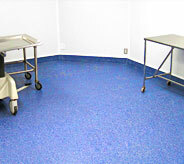 Not only do spills happen frequently there, but also knives, huge forks and a plethora of other kitchen utensils clatter to the floor, thus a commercial kitchen has a need for a puncture resistant floor. Another example is possibly a nightclub. You may wonder why until you envision some of the high heels that some of the women are wearing today. All of that weight, even with tiny women, on such a tiny heel can spell disaster to some flooring. Look it up on the Internet. The normal sized woman standing on one thin heel can deliver 13,680 psi! Ask your friendly engineer to work out what kind of heel force can happen to a floor? All that is needed is her approximate weight, the percentage of the weight that is on the heel, whether she’s walking or perhaps standing or worse yet dancing, the heel tip dimensions, and whether the heel tips are made of steel, plastic, or whatever? It’s astounding. High heels are especially deadly to laminate flooring. Moving on to one final sector which would be desirous of puncture resistant floors, and that would be a sports club where those in attendance may be wearing spiked shoes. Examples include golfers, track and field participants, football players, soccer players and of course baseball players. Each of those people may walk into a sports club area such as the club house changing rooms or gyms and dent the floors. Even small punctures, tiny tears and cuts to flooring can easily lead to the complete failure of the flooring. Take for example vinyl composite tile. Lovely to look at, but definitely cannot stand up to the high heels women wear nor to anything else that may land on that flooring. It will dent, it will puncture and it will unfortunately eventually fall apart. What is needed is some kind of flooring that features cohesive fibers that is totally puncture resistant as well as abrasion resistant, and that in a nutshell is Silikal. Silikal utilizes completely solvent-free dual component methacrylic resin that is called their enhanced MMA. This enhanced MMA is what enables Silikal to be as versatile as possible while always retaining the properties needed to be puncture resistant at all times and under any conditions. In addition the enhanced MMA is what allows Silikal to form the strongest bond to the substrate possible. Silikal has been called the lifetime flooring for a reason, and that is because of how lengthy its own life will be on your floor. Silikal flooring is not only fully decorative and extraordinarily beautiful, but it is also hygienic, seamless and multi-functional, all while offering the flooring protection needed by being totally puncture resistant flooring. It is the very quality of the ingredients that allow Silikal to outlast any competitor’s products. 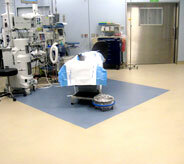 In essence there is no other seamless flooring offering puncture resistant floors better than Silikal.